Through Revista Digital de la Escena , the Theatre Documentation Centre offers a synthesis of the multiple reality of stage in our country. A reality contained in records, photographs, texts, links and audiovisual documents that form a summary of hundreds of hours of recording to broadly express the panorama of Spanish theatre. 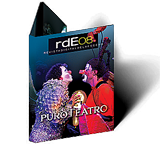 Between 2006 and 2009 , the Theatre Documentation Centre published four issues of the Revista Digital de la Escena in DVD-rom. 2010 meant the transformation of Revista Digital de la Escena , with a fully renewed format for each web browser. Here we offer the “still photo” of the magazine, which was renewed throughout last year. The section Con acento focuses on news and events that have occurred over the year. It is a space to reflect the important dates in history, to remember and say farewell to professionals of the stage, recuperating their work and images; we list some of the most prominent awards given during the year, stopping on some of those awarded to great figures to assess their career, and we report on the outstanding events over the year. El altavoz provides its own voice to our stage through interviews with professionals and the analysis of critics. The section Cartelera gives a selection of almost a hundred shows, with full information on each one, plus photographs and fragments of video. In total, almost two hours of video images and around one thousand photographs. This selection of a hundred shows –in Spain over one thousand shows open each year- is made with the aim of showing all genres and the widest panorama possible of what is done in Spain, of shows from which it is possible to provide quality images and an extensive reflection in the media.